We loved working with Young Kim. 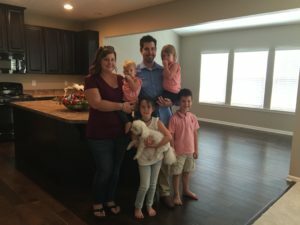 We had a difficult situation where we had to buy a property sight-unseen from California, but she made the whole process very easy for us and we have a wonderful home in Ohio now thanks to her. She went out of her way to drive to the property and do a Face Time walk through for us, was very attentive when it came to inspections, reports, and details with the transaction and when we finally arrived in Ohio to move into our new home, she welcomed us with a lovely basket of local food items and lovely red carnations – the state flower. I would definitely recommend her to any of my friends looking for a realtor! Thank you so much for all that you did in the selling of our home and the purchase of our new home. We feel that we have made new friends with you and John. You are such caring people. - Stephanie & Dan, Miami Twp. - Barry & Bonnie, Washington Twp. - Carey & Greg, Washington Twp. After our house was on the market for 9 months with other realtor, we ran out of hope. Thanks to you and your hard work, Less than 3 weeks our house is SOLD. You were a life saver! I needed fast help and you were there! Your professionalism and prompt attention to every detail was appreciated. - Roger and Linda, Miami Twp. Service was fantastic. We would recommend Young Kim to any of our closest friends and relatives. Young, I have thoroughly enjoyed working with you. I invite you to stop by my place. We appreciate your excellent service from start to finish. Not only will we consider your service again, we will highly recommend you to our friends and relatives. Young was at our service 100% of the time and would not rest until we were completely satisfied. Young made home buying process very relaxing even though we were young first time home buyers. The line of communication was excellent. You and your office staff always kept us informed. You let us know that we needed to do in order for the property to sell quickly. You made arrangement for the carpet cleaning and got an estimate for painting . You are very knowledgeable in the Dayton market. I am so glad Donna recommended you. Very detailed. The selling of our property was very smooth. You provided excellent information with a lot of good detail about market. We miss you! - J David & Maria, Washington Twp. We truly enjoyed working with you. You helped us get our dram home and we love it! - April and Tony, Miami Twp. I know you have a reputation for selling homes quickly, but mine was only on the market 5 days! Amy and I wanted to say thanks for making this huge decision of buying our first house. So easy going and fun. I would recommend you to all I know. Thank you for staging my house as well as helped me decide on a color to paint the entire house. You made me feel that I am “your only client” I wish that everyone that I do business with in every aspect of my life could be like Young Kim and her office staff! Her integrity, professionalism, knowledge, and over-all 5 star customer service is the kind you rarely find these days in the business world! Thank you so much for finding us the perfect home! We would never work with any other realtor! You responded to all my questions quickly. You made the process of purchasing our first home easy and stress free. I appreciate the representation for a first-time home buyer. Issues with the house were resolved satisfactory to save myself the most money possible. We appreciate your direct nature of dealing with both the sale of our house and locating a new house to live in. Your knowledge is obvious, and we appreciate your honesty throughout the process. I always knew if there was a condo out there for me, Young would find it. Young is assertive & takes her job seriously, which both work together to benefit her clients. Young made selling our house an easy and pleasant experience, because of the attention to detail and great customer service, I would highly recommend Young Kim to anybody I know looking for a REALTOR®. Your attention to detail, recommendation about staging, your services and customer focus is unrivaled. We will long remember your work. You should have your own show on HDTV. Marketing, Staging, and Selling, we very much appreciated your help lining up contractors to make buyer requested repairs. She worked with all my family… I liked the computer contact with my sisters and the immediate follow-up. Thank you! Thank you so much we couldn’t have done it without you! You are very thorough in the services you provide! As always we feel that you did an excellent job! All the details and leg work, especially related to the inspection follow up, you did everything perfectly. Thank you for your hard work! Appreciated house staging suggestions, additional staging after we moved out, regular updated comparisons to other houses. We really enjoyed working with you! Supervising and arranging carpet and paint vendors… at competitive prices. With current market conditions, the transaction was completed as best as reasonably expected. Young Kim is a pleasant, very knowledgeable REALTOR® I have recommended her to many people! We enjoyed having the differing viewpoints provided by Young. Thank you for a very enjoyable home selling and home buying experience! - Michael and Carla Berkshire, Washington Twp. Young and her team make you feel like family! Her services are professional, yet they are personal as she meets your specific needs. Young Kim is THE BEST! We appreciate everything you did to sell our house! - Sarwan and Swaran Sandhu, Washington Twp. We appreciate taking care of painting, repair, etc and informed us of progress. You did what you promised — Sold the house! Great job! Her timing and suggestions allowed us to sell our home for top dollar in 48 hours. …We would highly recommend Young as the consummate professional and expert in real estate marketing and sales. - Donald and Cissy Hansen, Washington Twp. I appreciate all the great advice you gave me about the economy and market. I enjoyed having Young as my REALTOR® and always appreciated Young and her team very much for their hard work during this tough market. Well done – and Thanks! Going above and beyond the call of duty was impressive! …We really felt we were being taken care of and not ripped off. I already recommended you to my friend.